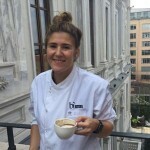 Belkis subscribes to the belief that many diseases are preventable through diet and together with Ozge, she is doing her part to create a place where Turkish people can discover the tasty, wonderful, colorful world that is plant-based cuisine. Özge is a graduate of TED Ankara College Prep and holds a degree in Economics from the Middle Eastern Technical University . After graduating she moved to Istanbul and enjoyed 13 high-tempo, colorful years climbing her way up the corporate ladder as a professional in the financial sector. In September of 2012 she found herself searching for a new inspiration of what she does for a living and in search of a new daily routine. 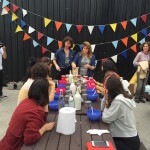 This led her to start researching various entrepreneurial endeavors. 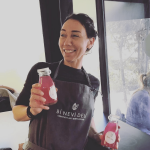 In July of 2014 her path crossed with Belkis’ and together they took off on a journey to bring plant-based lifestyle to the Turkish masses. She is an individual trying to live by the principles of environmental sustainability. Our aim is to produce delicious and nourishing dishes using whole-foods, plant-based, minimally processed ingredients. Our core ingredients are seasonal vegetables and fruits, grains, beans, nuts, and seeds. As we are a health-based kitchen, we aim to use anti-inflammatory oils and consider smoking point when developing recipes. We also feature a few no-oil added recipes using only avocado or cashews. If you are on a low-fat, vegan diet please let us know in advance and we can make recommendations accordingly. Our menu features dishes that can be suitable for a variety of eating styles. Plant-Based Diet: Belief in the “symphony of ingredients” and the benefits that come from eating all the colors in the rainbow a.k.a. Plant Power. This recipe for health promotes eating mostly plants, especially in season. It is for this reason that we take out most dishes in accordance with season. Whole Foods: In order to create delicious, nutrient-dense recipes we work with unprocessed, whole foods for the most part. Our recipes are primarily made up of vegetables and fruits, flavored with fats like avocado or cashews, milks like homemade almond milk, and thickened with superfoods like chia seeds or flax seeds. Raw Food Diet: Our menu features some dishes in line with a raw foods diet. We feature raw zucchini pesto pasta, raw cashew cheesecakes, chia puddings, crackers and cookies prepared in our dehydrator, not heated above 118 degrees fahrenheit. Gluten-Free Diet: Although we do feature gluten-free bread and crackers on our menu, due to cross-contamination we recommend anyone with a gluten allergy or celiac disease consult with his/her nutritionist before consuming our foods. Paleo Diet: Items prepared with seasonal fruits and vegetables, without beans or grains, refined sugars or salt. Vegan Diet: All of our menu is Vegan. We prepare these dishes without using any animal products such as red meat, chicken, fish, or by-products such as eggs, cheeses, and honey. Vegetarian Diet: Recipes without red meat, chicken, fish.